You’d never find this Knit Blazer in James Bond’s closet, but you might find it on the mastermind taking over the world. It’s bad, but in the best kind of way. It’s clean but certainly not clean-cut. It’s bold, but still understated. It’s battle-worn but still fresh AF. It’s just like you. Contrary to common belief, everything good happens after dark and the latest rendition of our coveted knit blazer is no exception. It’s just as bad, bold and battle-worn as its early predecessor, Quiet Slate, only this time around we decided to dim the lights for a darker more sophisticated look. Double-button front closure, knitted. Unlined. Sporting a raw-edge collar. Lightweight knit-fabrication provides stretch without sacrificing a tailored look. Dress it up or dress it down (regardless she’s going to look twice). Front darts. Side panels. 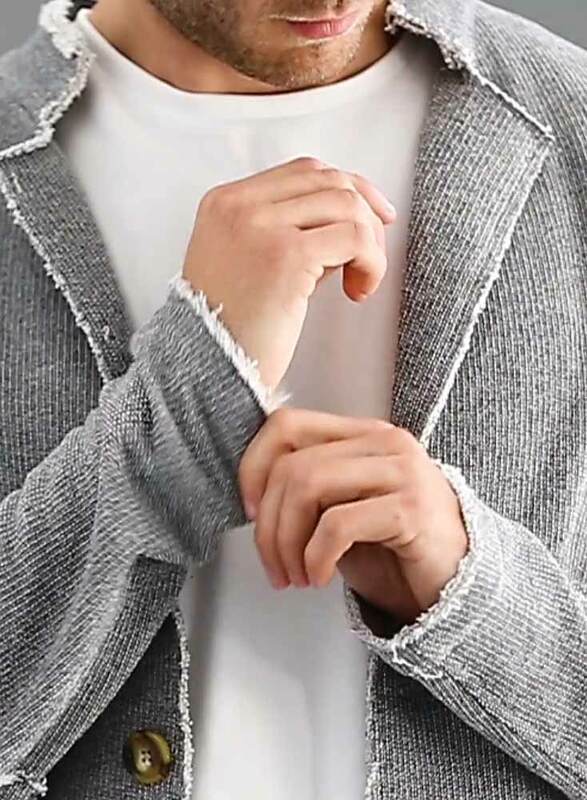 Elbow patches. Designed in Austin. Made in Italy. Built to go anywhere. Tumble dry low or line dry to preserve garment.